G & C Foods has signed on as a Gold Level sponsor for “May the Fourth Be With You” Bowl-A-Fun. 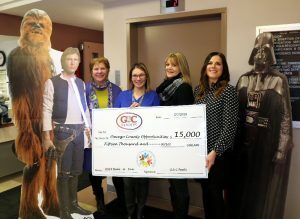 Flanked by some intergalactic celebrities are from left OCO Executive Director Diane Cooper-Currier, G & C Foods Director of Organizational Development Sara Johnson, G & C Foods Director of Operations Diane DiSanto, and OCO Development Coordinator Bridget Dolbear. OCO’s “May the Fourth Be With You” Bowl-A-Fun offers a morning and an afternoon flight. For more information on team registration, donations and sponsorships, visit www.oco.org or contact the OCO main office at 315-598-4717.